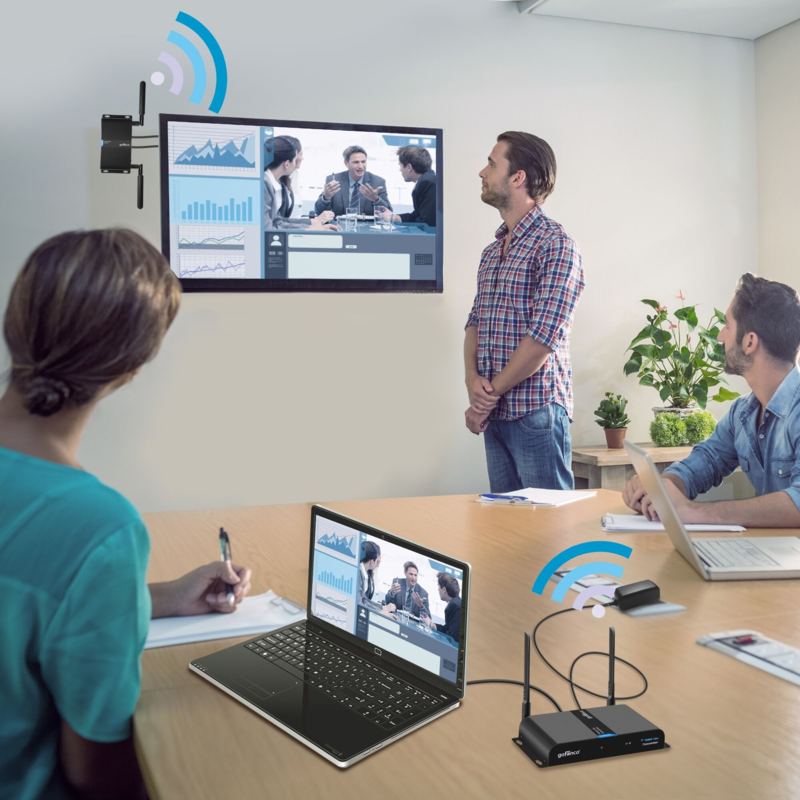 Our Wireless HDMI Extender Kit with Dual Antenna 1080p – 165ft (50m) (HDwirelessDual) extends one the source device, Lenovo ThinkSmart Hub 500, to display on one projector screen/LCD. The source is on the other side of the display connected to the transmitter and the receiver, located next to the projector, is connected to the HDMI out to the projector. This set up gives a cleaner overall solution with fewer cables. The content is primarily presentation materials, but also video conferencing. The distance between source and display is less than 20 feet, as all of the components are physically in the same room. Lenovo technical product team was very happy with the ease of set up and performance of our product. There was a bit a latency in video streaming, but was very minimal that didn’t compromise performance. Our wireless solution is tied to Lenovo’s Smart Office solution series and their pre-sales engineers continue to demo our products in huddle and small team rooms. Watch how Lenovo’s ThinkSmartHub 500 helps you collaborate better here and have timely meetings here.